US Secretary of State Hillary Clinton was at this writing meeting with Egypt's Field Marshal Hussein Tantawi, a day after holding talks with newly-elected President Mohamed Morsy and urging a “smooth transition” to full democracy. She landed in Egypt on Saturday in the middle of a tug of war between the Supreme Council of the Armed Forces (SCAF) headed by Tantawi and Morsy, a longtime member of the Muslim Brotherhood. Morsy triggered the standoff by ordering parliament to reconvene in defiance of SCAF’s earlier decision to disband the people’s assembly. Clinton’s arrival in the Egyptian capital, he writes in his daily column for the leading Saudi daily Asharq Alawsat, “comes at a historic crossroads” for U.S. policy. “The visit comes at a time when the U.S. administration is changing Egyptian horses in midstream – from betting on the military since the 1952 coup to betting on the Muslim Brotherhood movement’s rule. “Clinton comes to Egypt amidst a constitutional, legal, popular and information struggle that risks turning bloody. 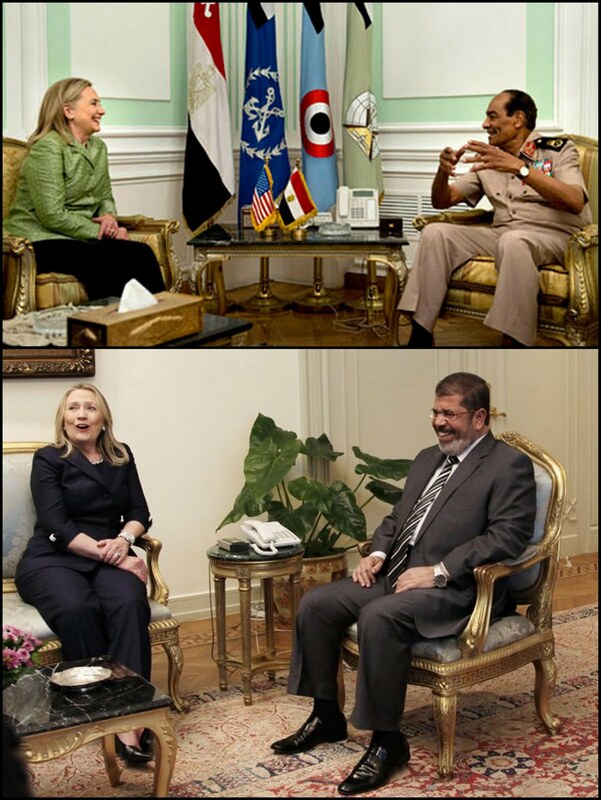 “She comes after half the Egyptian electorate voted against her administration-backed Brotherhood candidate.